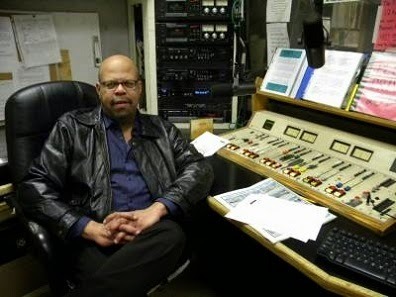 In addition to being a board member of Theaster Gates’s Black Cinema House and a film journalist for Indiewire’s “Shadow and Act”—a Ralph Ellison-inspired blog dedicated to the cinema of the African diaspora —Sergio Mims is also one of the most well-established DJs on WHPK’s classical format. For the second interview in our series profiling the veteran DJs of WHPK, Mims invited us into the studio as he played Schubert’s opera Fierrebras for the first half of his radio show—the unpretentiously titled program, “Stuff From My Collection”—to discuss his loves, hates and obsessions within the worlds of music and film. How did you first get interested in music, especially in classical music? I have to go back to when I was ten years old. My father used to give me all kinds of recordings to listen to and one day he gave me a recording of Gilbert and Sullivan’s The Mikado [and] I just gravitated towards it, I thought it was the happiest music I ever heard. I said, “Gee, I’d like to hear more like this.” At that time, there used to be a supermarket called A&P, back in the days long ago. They would sell classical records. There’d be a different one every other week, with notes, and later you could compile all the records into a binder. I still have it… and back then they would have record clubs. They had Columbia Record Club or RCA Record Club, and they’d announce that you’re getting this album for this month, and my father joined it for me, so I was just getting records. And why classical music? I don’t know, that’s sort of an eternal question. It’s just something that spoke to me; I just gravitated towards it more than any other music. I can tell you who I don’t like. That’s easier. I like [almost] everybody, I can listen to everybody from Monteverdi to Stockhausen to Hans Werner Henze to Allan Pettersson. Who I do not like, who I cannot stand—I cannot stand Puccini, cannot stand Ralph Vaughan Williams. I always say, if I was captured and you wanted to torture me and get me to say everything I knew, put on La Boheme, or anything by Vaughan Williams, and I will confess everything. There are some composers who took me a while to warm up to, people who I like now who I didn’t like before, but I will never like Puccini and I will never like Vaughan Williams. Aaron Copland has a great quote about Vaughn Williams that perfectly expresses how I feel: “Listening to the Fifth Symphony of Ralph Vaughan Williams is like staring at a cow for forty-five minutes.” I don’t know why Puccini’s so popular. I always say, people who like Puccini don’t know music. So I take it you’re not a fan of half the Lyric’s programming? No! I won’t go [when they play Puccini]. And by the way, I’m glad you brought that up. Because of this show, it’s really expanded my horizons, I’ve been traveling even to Europe to see concerts. WHPK programming, and my show in particular, are known outside the country, so I have been to the Royal Opera House in London, I’ve been to the English National Opera, I’ve been to the Lucerne Festival in Switzerland. I was actually asked to be on a Swiss Radio Program last year, but I couldn’t do it. This is because of the show and [online] streaming. Classical music broadcast radio stations are a small community, there’s not a lot of radio stations left that broadcast classical music, and everybody tries to seek out what everyone else is doing. How did you get started with DJing at WHPK? Well, that was Jake [Austen, format chief for Public Affairs programming on WHPK]. Jake was after me for almost a year trying to get me to do a show on movies, which I still do about once a month on the station. But after a year I gave in, and I said, “OK, I’ll do it.” And I did it for about 3 or 4 years, I would bring in filmmakers, we would do a discussion, but I said, “Boy, I would really like to do a show on classical music,” because when I got involved with WHPK and I saw all the kinds of programming they have, I said, well, I would like to do something like that. And one summer a position was open for a slot, and I just jumped right in, and that’s been it ever since. Working and doing this show on WHPK has been a real unexpected joy for me. Can you talk a bit about how you decide what music to play? It’s “Stuff From My Collection.” That’s it, it’s my collection. I have a huge collection. I never repeated myself or played a recording twice, because I have that many recordings, and I can look and see what I’ve got and what haven’t I played yet. And I like to play extremes: I will contrast Mozart with Schoenberg. Things like that to play around with the programming, to give people a sense of what’s out there. I always want to do something different with my show. I don’t want to do the obvious stuff, I’ve never played Beethoven’s Fifth, I’ve never played Dvorak’s Ninth Symphony. What I’m really interested in is giving people a broad view of what classical music is, which is why I’ve done everything from baroque to really 21st-century stuff. Just yesterday, I broadcast John Adams, his new work Gospel According to the Other Mary. I everything, from one extreme to the other and everything in between. And I hope that, if you didn’t like this, maybe I got something else coming up, or something next week that you’ll like. I gotta play something you like.